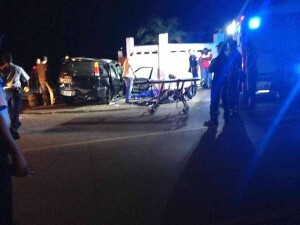 WILLEMSTAD - On Friday night, a third victim of the accident with an SUV at the Kaminda Mitologia died in the hospital. That was announced by the police. It's a Venezuelan man. He died around half past twelve. The SUV crashed into a church wall in the area of St. Joris. The driver led the police on a wild chase which ended in the fatal accident. A man and a woman died on the spot. Just two hours prior to the accident, the police received a notification from the Coast Guard that a suspicious boat was signaled at St. Joris Bay which would have dropped off some people. On the way there a patrol came across a black Honda SUV which was heading towards the opposite direction at high speed. The officers ordered to SUV to stop but to no avail. The SUV led several police cars on a high-speed chase. The police also shot at the SUV. One of the eight occupants was hit in his throat, presumably by a police bullet. Whether he is the one who died on Friday night is still not known. In the crashed SUV, twenty firearms were found with ammunition. During the chase, a plastic bag of 19 packs of marijuana was thrown out of the car. Six of the occupants were Venezuelans and two of Dominican origin. Three of eight were women. Two of the eight are residents on the island.